ZipSnip, the answer to your cutting woes? 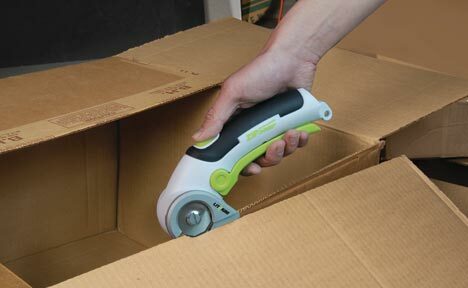 The ZipSnip is a 3.6-volt lithium-ion rechargeable electric material cutter who purpose is to make cutting simpler. Its circular cutting blade makes it ideal for zipping through cloth, leather, plastic packaging, corrugated fiber board (aka cardboard) vinyl sheet goods, rubber liner, landscape fabric, canvas, wire, wrapping paper, etc. The 1-1/2” hardened steel cutting blade is configured to self-sharpen against a small sharpening stone so you don't have to worry about a dull blade. Even after you have worn down the blade to nothingness, you can simply swap it out for a new blade. The ZipSnip weighs in at one pound, so it is probably a little heavier then the scissors you are used to using, but its cutting speed will cut down on your cutting time. The rather large trigger switch on the ZipSnip should make it easy for people of all ages to use, but the safety switch on the top will keep the tool from attacking on its own. The cutter uses a 1.4Ah 3.6-Volt battery that can be completely charged in 3-5 hours, and can hold its charge for up to 24 months. Except for the trigger mechanism, the ZipSnip looks identical to the SKIL Power Cutter, which I own. So I can confirm that this tool can cut through everything in the above materials list, and that the battery can hold a charge for a very long time.